Shorter days in fall and winter, combined with comparatively chilly fifty-degree nights in the greenhouse, inspired my colony of paddle plants to soar into bloom. Vegetative stems are squat, with closely spaced pairs of blue-white round leaves that are, indeed, the size and thickness of paddles—or flapjacks or cabbage. They bring unique coloring, texture, and architectural presence to the garden. When each stem is a year or two old, a tall flowering stalk emerges from its tip. I had placed the large pot containing my colony of "paddles" on the top shelf of the shiny metal rack in the background, so this heat-loving succulent wasn't stressed unduly by the greenhouse's fifty-degree nights. But then I needed to be away from the greenhouse for much of November. No problem: it's a month when most of the plants snooze as the days shorten and the sun weakens. Inadvertently, I had provided excellent conditions—cooler but not chilly, and without the water that might have caused rotting—for the paddles to form flower spikes. With the pot on such a high rack, the stalks were hitting the translucent roof of the greenhouse by the time I returned in December. So I moved the container down to a main bench, which also brought the entire colony into right-at-hand view. And hooray for that: a paddle plant in bloom is a strange beast that deserves to be appreciated in every detail. First off, how powdery white is that stalk? And by powdery, I mean literally. Kalanchoe luciae is native to southern Africa, and its common name in the Afrikaans language is meelplakkie, which means "flour plant." Indeed: look at the white "flour" on my fingers. The latin name for such a powdery surface is pruinose; pronounce it "PRU-i-no-ss." The stems of paddle plant are so pruinose that the excess slides around the stem into ridges and larger granules. It also falls off onto the foliage below—and adheres to anything it contacts. By the time I'd moved the pot down to the main bench, my fingers and patches of my shirt had become pruinose, too. After I'd gotten over the surprise of being "dusted" by one of my plants, I checked out the dense clusters of pale green buds. Glancing quickly up and down the clusters for blossoms that may have started to open, I realized that I had become blinded by expectations of a bigger show: some blossoms were already fully open, but their size is scarcely larger than the buds, and their coloring is the same pale green. Eight stamens tipped in yellow and brown pollen were each tiny flower's only color contrast. Humph! 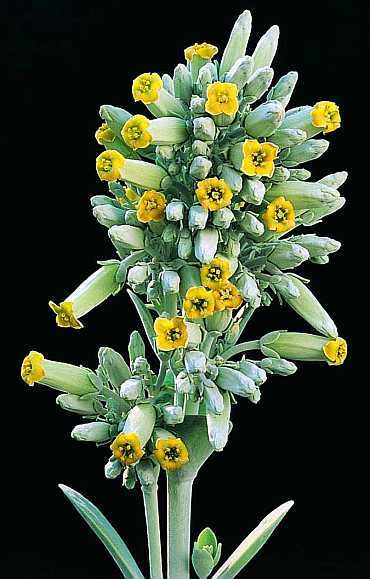 Flowers of a similar species of Kalanchoe, K. thyrsiflora, aren't larger, but do turn an honest yellow when they open. They are reported as being sweetly fragrant, too. Despite its monochromatic floral display, Kalanchoe luciae is still the better choice if the plants can be expected to experience both bright light and chilly temperatures: then much of the outer perimeters of the leaves darken to a vivid mix of pink, orange, and red. The lower (but still above freezing) the temperatures, the greater the proportion of each leaf that reddens. All the while, the bases of the leaves remain silvery blue and the stems remain powdery white. The bicolored foliage combines with the white stems to create a cool-weather show that is so striking and distinctive that the monochromaticity of the flower spikes is a relief: they usually appear winter into spring, which is the same time the foliar color is at maximum intensity. You'll note that, despite the cooler temperatures, the leaves of my plants—alas—are still the same impressive silvery-blue they were when the colony was enjoying the warmth outdoors in the garden. Why? It's likely that the fifty-degree nights in the greenhouse are low enough to encourage reddening. In climates mild and dry enough for it to grow outdoors, Kalanchoe luciae will survive light frosts, but foliar reddening happens where colonies aren't "mortally" challenged by what, for this species, would be any temperature in the thirties Fahrenheit, let alone the upper twenties. The stresses that cause reddening are, by comparison, mild: chilly but not freezing. Week after week of fifty-degree nights would be chilly enough. Rather, my plants' lack of foliar reddening is due to the low intensity of the light that can penetrate the double layer of the greenhouse's plastic poly-film "skin." Outdoors in the garden, even weak winter sun has intensity that light in a greenhouse just doesn't. Plus, the spectrum of this already-weaker light has been "thinned" by passage through the poly. I myself don't have access to sunny, frost-free overwintering that's achieved by glass, not poly, but I'll keep my eyes open for paddle plants when visiting classic glass-roofed conservatories. Another quirk of the heavily "floured" flower stems is that the stems shed the white dust onto the foliage below. It's a mess, not an adornment. All in all, paddle plant's flower stalks are a mixed blessing. More strange than beautiful, they are a pleasure to discover—and could be an effective juxtaposition with the dense "red cabbage" leafiness that is often on display the same time. But Kalanchoe luciae isn't hardy in New England, so colonies would survive during the cool months only if they were sheltered. In shelter achieved by anything other than glass, paddle plant foliage will never enter its red-cabbage phase. The foliage of my colony, then, is most likely to remain silvery blue year-round. Next year, I might clip out the emerging flowering stems and, so, keep the colony focused on vegetative growth. Then I can keep the pot on the highest—and, therefore, warmest—shelf the entire winter. My reward will be quicker and lusher vegetative growth, for an even bigger show of silvery-blue foliage each summer. Here's how eye-catching Kalanchoe luciae is in its vegetative phase. Here's how to grow velvet leaf, Kalanchoe beharensis; its hardiness and handling are similar. The biggest difference is that K. luciae is likely to flower annually, and stems that flower eventually die back to their base. Clip them off as they fade, allowing basal sprouts to take their place. If you choose to clip flowering stems off as they emerge, the remaining vegetative portion of the stem may well persist. Even so, its chopped tip will still be visible. As basal growth begins with the return of warm weather, cut this lower portion off, too.